Are you in the need to get around quickly without the effort? This is the ideal set of wheels for you. 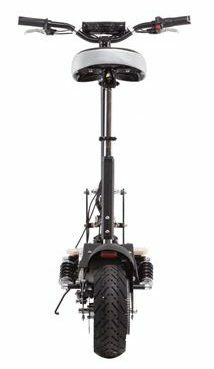 Save money, save the environment and save your poor legs from long walks, as the Chaos (Sport) Big Wheel electric scooter has your back! The scooter itself is the fastest of the FunBikes Power-board selection, so you know you are getting the very best. It’s great for taking yourself back to childhood when you could zip around on your little scooter, but with a more powerful twist! Stick around to see its incredible features…. Of course, you’ll definitely get the scooter for one! It also comes with a built in battery and its very own charger, so you can top it up when you need to give it some juice. The scooter itself is incredibly versatile and sleek in terms of both use and storage. It has large satin black alloys alongside a gorgeous wooden deck, as well as sport-level tyres to make sure the scooter is save and reliable to use. It is made with great care to ensure you stand out when using it, have great quality and get as much out of it for such a reasonable price. The motor inside the scooter is called a ‘brushless motor’, which will give you a guaranteed excellent performance compared to other scooters on the market with brush motors, which can hinder the length of time in use. When you aren’t using the scooter, there’s nothing worse than keeping something that simply does not fit anywhere or takes up space where you don’t want it to be. However, with the Chaos Sport scooter, you can fold it up with one simple touch, giving you plenty more opportunities to hide it away when you don’t need it! Overall, the scooter has an excellent level of performance that will make any user feel like they have really found a bargain. 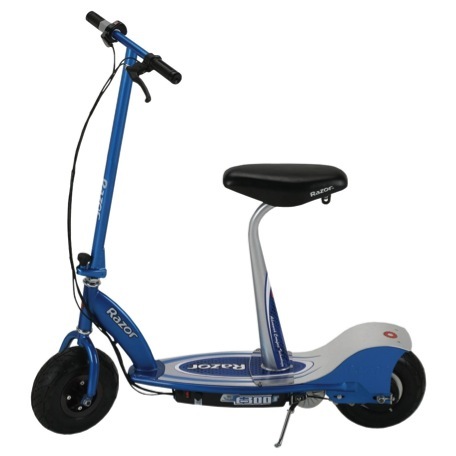 It has a chain driving system, as well as a 12AH battery, which combined with the brushless motor and sport tyres will keep you buzzing all day long. Its maximum range is twenty kilometres, which is an ample distance to give the scooter a go. The battery life will keep going for over 250 cycles, meaning you only have to charge it on the odd rare occasion. 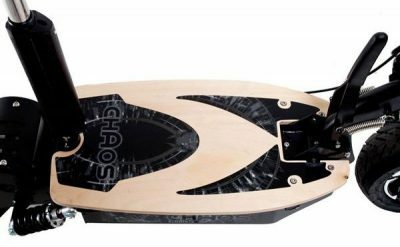 The Chaos Sport scooter is not only fast, but also incredibly light. Its minimal design means it only weighs forty-six kilograms, and is both 44 inches long, and 42 inches high. In order for the scooter to work effectively, the maximum load is 120kg, so it can zip away with ease. What are the other specifications? As well as the extra bells and whistles that this moped has, it’s also incredibly safe and reliable to use. The brakes themselves are disc brakes, meaning that they can be counted on to come to safe and gradual halt when required. The electric motor is great for reducing your carbon footprint, as all it requires is a simple charge up! The frame is made from chromoly steel, which you can count on to be sturdy and supportive of a respective weight. It has a twist grip type throttle, so you really have all its power at your very fingertips. Although it isn’t road legal, it is suitable to use on private roads and off-road with a gentle terrain, nothing too rocky! 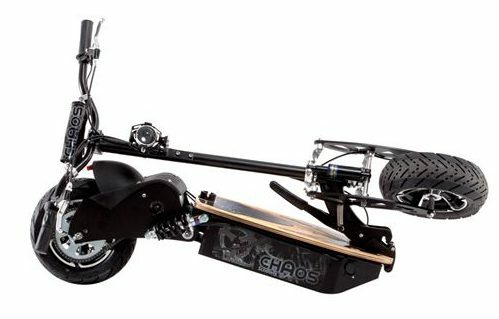 The Chaos Sport scooter goes at a top speed of 40 kilometres per hour, giving you an incredible rush as you feel the wind whipping past you. Of course, this scooter is a lot more minimal in frame and design than an average car or motorbike, so any faster than forty would feel pretty terrifying! The scooter is light and simple in build, so it can hit this top speed with ease. Yes there is! The manufacturer’s warranty covers the first six months of use, covering any defects in parts that are on the scooter. The battery has a separate warranty of three months, so it’s worth keeping an eye on everything on the scooter for the first few months of ownership. Get Yours Now: £520.00 at Fun Bikes. Are you bored of turning up the air conditioning in your poky car in the height of summer? 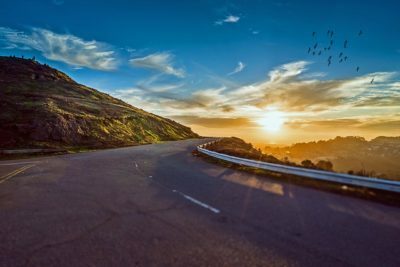 There is nothing better than feeling the breeze whipping past you on a moped, the ultimate feeling of freedom as you’re getting to your destination. It’s far from the fuel-draining, oily mess you have probably been donning as your first car. The EvoMotion E-3000-RX is a groundbreaking advance into the future of mopeds, with its clean and electric power that benefits both your bank balance and the environment. Its powerful motor and quirky design will really turn heads on the usual dull commute! What’s included with the moped? To start off with, you obviously get the electric moped itself. However, it comes with a couple of extras to give you the full package and EvoMotion experience. Along with the moped, you’ll receive a charger, that can keep it topped up with plenty of juice to get you where you need to go. This means that there’s no more crowded petrol stations, as well as being great for the planet. The moped also comes with an instruction manual in English, so that you can get to know the scooter and all its bells and whistles inside out before hitting the road. When buying a new zip-around, the most important thing can be the power. Never fear, the E-3000-RX moped has a 3000W hub motor, that is as powerful as a classic 50cc petrol bike. It’ll get you up to some pretty nippy speeds, but for simply going from A to B this motor will definitely not let you down. Also, the top box is pre-fitted, along with there being a storage compartment under the seat, to keep your things when on the move. More importantly when it comes to getting to your destination, this moped is approved for road use, woohoo! Even better, you don’t pay any road tax or congestion charge, so keep those extra pounds safely in your bank account for a rainy day. So far, this moped seems like an absolute winner – and all things considered, you won’t be using this scooter on the motorways, so don’t expect superbike level power from this quirky guy. However, you’ll find for the classic moped journeys it’s ideal, giving you two days of average use or enough juice for a long adventure. When you want something to zip through the city with, the last thing you need is for it to be heavy and cumbersome. That’s why the E-3000-RX is incredibly light at only 100kg, so can be transported easily and won’t weigh you down too much. The E-3000-RX can get you top speeds of 45kph, which is ideal for what this moped is designed for (urban areas and towns). This does depend on how heavy the scooter is, the terrain and temperature, but on an average day in England its unlikely to cause any issues. You can keep the moped going for 50km solid without charging, giving you plenty of juice to take it on multiple little trips or one big adventure. The moped itself charges fully within 8-10 hours, so can be easily charged overnight or before a journey. Aside from all the great stuff we’ve previously mentioned, the E-3000-RX has a few more extras that make it the ideal moped. Firstly, it comes with 12 inch pneumatic tyres, giving you a smooth and safe journey on a variety of different roads and terrain. To keep you even safer, the E-3000-RX comes with front disc and rear drum brakes, that will give you peace of mind when making your journey. Above the tyres and brakes we have a high-tensile, twin-tube steel frame, that stays sturdy and powerful beneath you, encasing water resistant electrics to keep you going in all weathers. Finally, it also comes with a 72V, 20Ah gel battery, to maintain that excellent speed and power wherever you choose to go. Indeed there is! There’s a twelve month limited warranty to protect you against anything that may go wrong with the bike without any personal responsibility or involvement. In order to get all the ins and outs of this warranty, you’ll get that all from the manufacturer and/or the moped’s supplier. Buy now for £749.00 (on offer)! Evo Scooters have recently brought out a new range of scooters called the EvoKing. King of the electric scooters? So what’s new with the EvoKing electric scooter? Well the design is improved, including the suspension and tyres, and new free wheel hub, plus there’s other new features which we’ll look at later, and overall improved performance. We’re looking at the 1000W motor in this review. What’s included when you receive your EvoKing? The box contains everything you need to get started with your road legal electric scooter. The electric scooter itself. A charger. A tool kit. And an instruction manual. Unfortunately there is SOME assembly required but it’s not difficult. Most people should be fine. You need to add the handle bars, the seat stem and seat, and front light. (The manual does note that when the electric scooter was made, the handle bars were fitted and then removed for shipping, so you can end up with some marks in this area but they’re covered up by the handlebar bracket when you refit them and the marks then don’t show, so it’s not a big issue). You then need to install the fuse. Following this, or whilst you’re assembling, charge up the battery and finally check the tyre pressures are okay. It’s all detailed in the manual and if you get stuck at all you can always call Evo. The suspension has been upgraded. Extra large 30cm diameter tyres. New free-wheel hub – giving lots of extra power saving. How is it charged up? Being electric, it plugs in. Charging time is 4-6 hours so do ensure you allow yourself plenty of time for a full charge before you’re planning on going on any longer trips. A full charge will take you 25km or 15.5 miles. This is really not bad is it?! The top speed is 45kph or 28 miles per hour. This is faster on smoother roads, and slower on more bumpy surfaces. Yes, it has LED lights. I do recommend you wear appropriate clothing so you can be seen at night despite the lights. What weight must you be to ride it? It’s really not a child’s electric scooter, so please don’t let your children on it unless they older and very responsible in a safe place. The maximum weight is 120kg, or 19 stone. The EvoKing measures approximately 130 x 60 x 104cm. How can it be stored? Because you can fold the EvoKing it makes storing it really convenient and it only takes a few seconds to fold. I love how it even fits in a car boot so you can take it anywhere and scoot everywhere! Of course it is quite heavy so you do need to have a decent amount of strength to be lifting it into car boots (or up and down stairs). What do I need to do to drive it on the public roads? I wrote a full post on exactly what you need to do to ride this electric scooter on the road. Read UK electric scooter laws. In a nutshell, you need the certificate of conformity that Evo will provide you with when you purchase your electric scooter. You then need to register it with the DVLA for £55. There is no road tax but you will need moped insurance. Electric scooters are currently classed as mopeds. This could all change one day. You’re also supposed to complete a short road safety test. It might seem like a lot of hoops and put some people off but it’s not that bad and means you’re set for riding your electric scooter anywhere on any road then. As mentioned, this electric scooter is only for adults and very dangerous for children. Make sure you carefully check all nuts and bolts, and tyre pressures and steering before riding too. Safety wear and helmets should always be worn. You should have some knowledge and understanding of mechanics or know somebody who can carry out any repairs. The EvoKing is a great powerful, folding, road legal electric scooter and has some quality upgrades from the original Evo folding electric scooters. They are a big investment of course, but for the right person electric scooters are so convenient not only for travel and commuting but they’re damn good fun to ride on!! 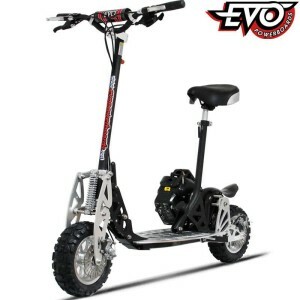 Buy from Evo Scooters for £599.00. (Stock levels are running low). 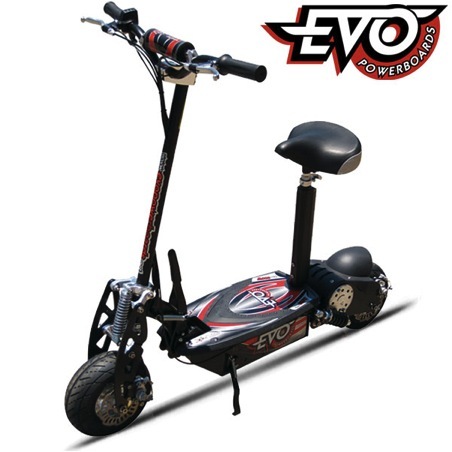 The Evo 1000W Powerboard Electric Scooter is a very powerful scooter for adults with one of the strongest motors on the market today. 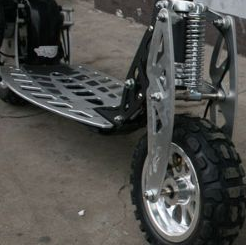 It feature a high tensile steel frame that is both light and durable and a paint job that will make most adults feel slightly more cool on their scooter. Best of all, the Evo 1000 watt can accommodate up to 120 kg of weight! The 42 Kilo box will arrive at your door containing a ‘some assembly required’ scooter, 3 battery pack and 110V-240V charger. You will have to read the instruction manual to put together the tires, the handlebars and the seat but overall, it is an easy task that shouldn’t take more than a few minutes. With 10” Aluminium mag wheels and oversized tyres, the Evo looks cool right from the start. The flashy paint job covers a durable steel frame that while heavy, can support a great deal of weight. 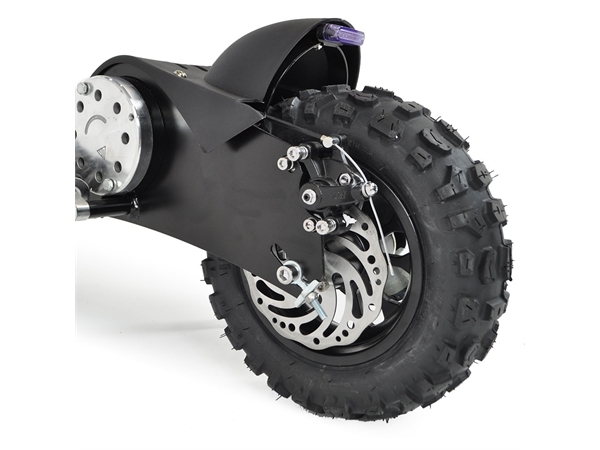 The motor is battery powered with motor cross style handlebars, chain system and front and rear disc brakes. You can go up to 45 km per hour on this bike which makes it one of the fastest scooters in its range. 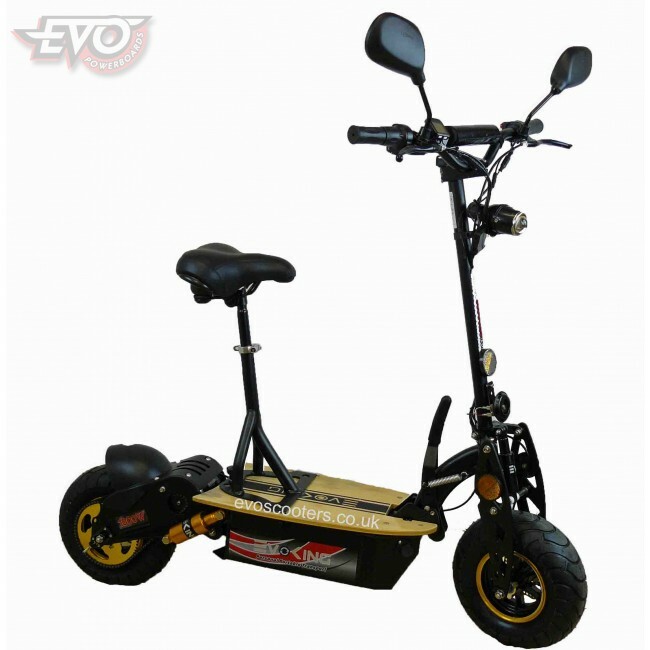 The Evo 1000 watt is a very large scooter that is very suitable for larger adults. It can be used to commute to and from work within a 20 km range and can go at speeds of up to 45 km depending on the terrain and the weight of the driver. This means that it can be used as a green way to drive to work and can save you on parking for short trips to town. 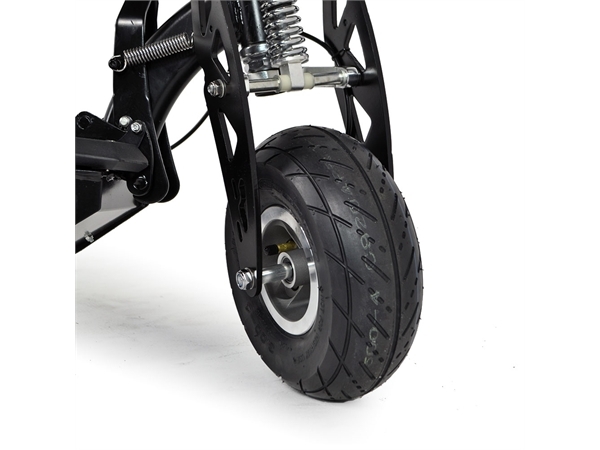 The large wheels make it easier to go over small bumps in the road while the long life batteries mean that you won’t be stuck somewhere with batteries that won’t recharge. The steel frame is extremely sturdy and the most you will ever have to worry about is getting a flat or scratching the pristine paint job. With 1000 watts of power, the Evo can also easily handle most hills which is more than most scooters can say. The Evo is extremely heavy. When you have to fold it up and put it away or potentially pick it up and take it up stairs (if you live in a flat without storage) it could be difficult, especially if you have back problems. “i bought these two scooters for Christmas presents because we hired them when on holiday to get around. I agree with this reviewer. They are easy to fold and take about in the car. 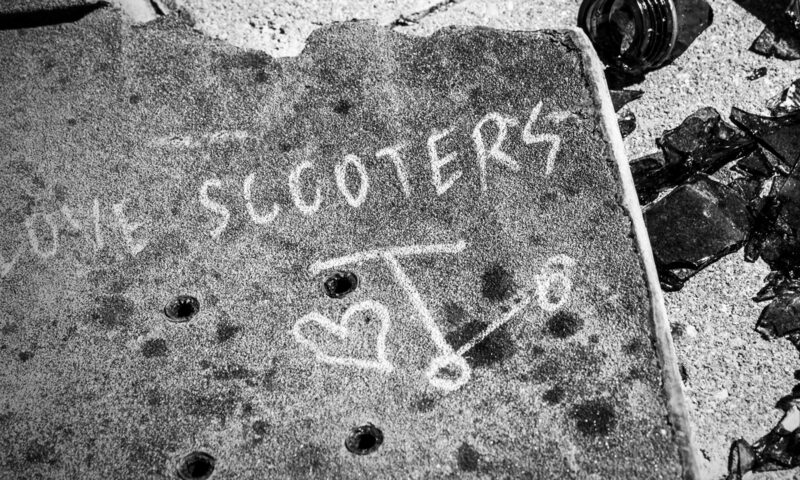 Two reviewers commented that these scooters can only be used on private land. One saying that even though they’re supposed to be used on private land, they’d still go everywhere on it. This next reviewer left an unnecessary 1 star review. It’s a real shame because it’s not about the scooter, it’s their own problem and it could put other people off this awesome scooter if they look at the reviews and see 1 star. Why do people leave negative reviews that are not about the product? This next review doesn’t make a lot of sense and I’d be interested to find out a bit more about the problem. It is very vague. Is it charged properly? Have they done anything about it? Bang on! It is heavy I would agree with this but the good points more than make up for it. Haha I love this review. They are the future. Indeed. You can read more about these, the spec, the delivery and returns HERE. The Razor E300S is a seated scooter for teens and adults that supports up to 40 minutes of continuous drive time and a detachable seat so that you can ride it standing as well. Your scooter will arrive in a 27 kilo box that you might require help moving. Inside of the box you will find the scooters basic parts of wheels, seat stand, seat, grips and various nuts and bolts. You will be required to assemble it using the fairly simple instructions that come with the box but this doesn’t really take too much time. 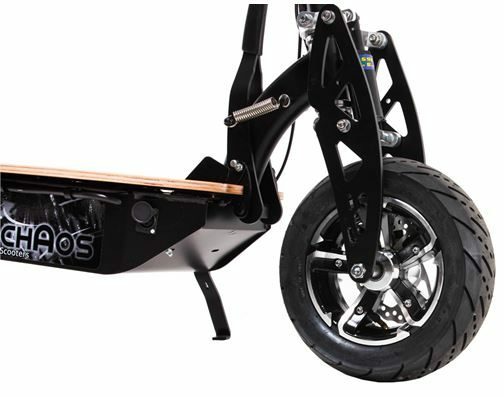 The E300S features a detachable seat that can easily be removed from the scooter for stand up riding, the process is fairly simple and the seat is quite sturdy when put into place. The E300s supports up to 100 kilos of weight and is intended for adults aged 13 and up. 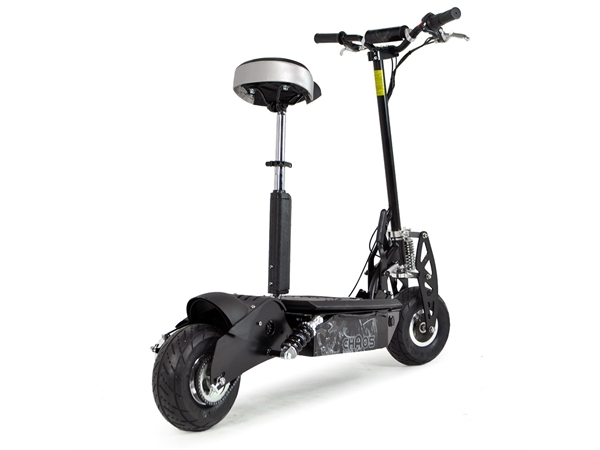 The 250 watt motor goes to speeds of up to 15 mph and the entire scooter can be folded down into an easily stored smaller size. The large deck is ideal for adult riders and the product is created using ‘green’ materials. The electric scooter is a great, environmentally friendly way of getting around short distances for adults. It supports larger adults of up to 100 kilo which is perfect for most adults. The scooter is fast, thrilling and easy to learn. You can set it up, run the manual and take a few practice sessions in the driveway to learn it completely in less than twenty minutes. The scooter has a supersized deck which is perfect for adults. Added to the high speeds, quiet motor and the versatility of the scooter; it’s great for pretty much anyone. The Razor E300S Scooter weighs 26 kilo which is pretty weighty. You also have to be careful when lending the scooter to children as it might be too fast and too heavy for them. If you are truly concerned about how much space this will take up, you might also want to go with another brand. This is very sturdily built and while durable, will take up a little extra space. Other than that, there really aren’t any noticeable disadvantages. 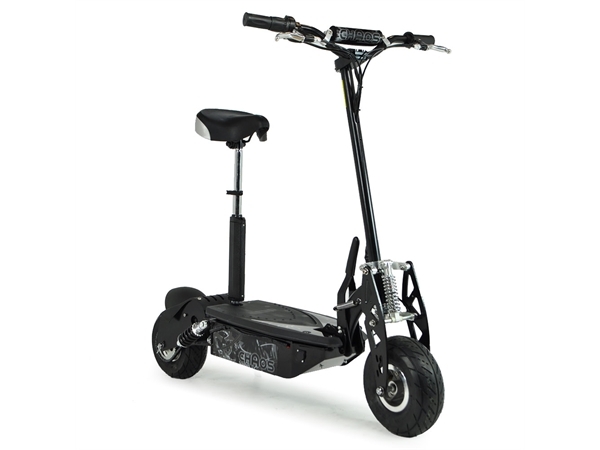 This is a great scooter for adults because it can be used to cover short work commutes and can be recharged literally anywhere. 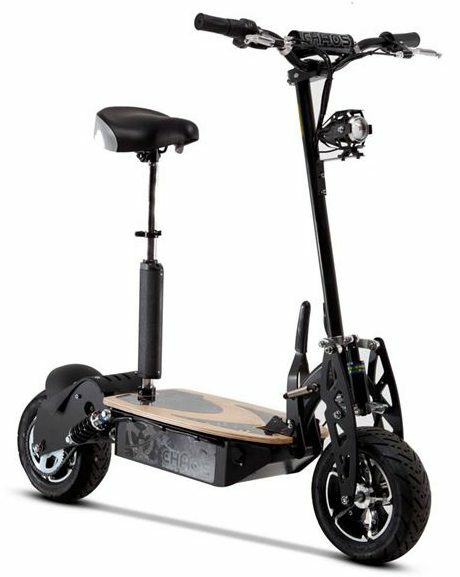 For anyone weighing 100-60 kilo it is a fast, fun and reliable scooter. The battery is rechargeable and lasts up to 1 year. ThIS electric scooter is durable, heavily built and can go up to 15 miles an hour which is actually pretty fast for an electric scooter. The Razor e3200S scooter is priced at £209.95 which is slightly higher than some models but is reasonable and even expected of the quality.